Burt Reynolds. Eddie Murphy. And now Sylvester Stallone. I think it’s time we do away with the conventional wisdom that the Academy loves the sentimental win for acting awards. Yes, maybe Leo’s win for Best Actor was in many ways an “it’s his time” award but his team had plenty to back up his case for winning. (Even though Tom Hardy had the better role and better performance in that film.) Stallone was the sentimental favorite last night and all the pundits confidently called it for him. I make Oscar picks on a continuum of rarely-to-never but even I got caught up in the Rocky Balboa nostalgia. I told anyone who asked that the only lock at the Oscars this year was Stallone for Best Supporting Actor. Pundits pointed to Mark Rylance as a close second who would be back and win someday. Everyone recognized his performance as the best thing about BRIDGE OF SPIES. But those of us who picked Sylvester Stallone believed this was probably his last hurrah. (And Stallone’s performance is one of the many things to appreciate about CREED.) So, just like Burt who people thought was a lock for BOOGIE NIGHTS, and Eddie Murphy – a lock for DREAMGIRLS, now Stallone goes home empty handed. I didn’t watch the Oscars last night. Might scan through the DVR today and watch a few highlights. I saw posts on social media that indicated the broadcast was less than stellar but the awards themselves were fresh and surprising. What did you think? I’d be interested to know. (Los Angeles) I just drove by Hollywood Blvd. It’s a mess down there, as final preparations are underway for Oscar’s big night – his 88th. I don’t make Oscar predictions – wrote about why last year in case you care to read. But that doesn’t mean I don’t enjoy the spectacle. I just enjoy it more when I’m not worried about keeping up with a ballot. Forget everything you just read for a moment. The only lock I see this year is Sylvester Stallone for best supporting actor. And I think it’s well deserved. Has any actor played a single role longer and with greater affection for the character than Stallone has for Rocky? The symmetry of his breakthrough performance 40 years ago and his bittersweet performance in CREED are the stuff that Oscar dreams are made of. Good for him. He’s hit all the right notes in the campaign and I for one am buying what he’s selling. I was sure that Sir Ian McKellan was going to be nominated for MR. HOLMES this year. Beautiful film. Wonderful performance. Alas, it was not to be. And speaking of #OscarsSoWhite, I don’t have much to say on the subject here but I do highly recommend THR’s Senior Editor Marc Bernardin‘s compelling article on why black movies have to be about MLK and white movies can be about a woman who invented a mop. Check it out here. The first Academy Awards was held at the Hollywood Roosevelt Hotel. 270 people attended. They each paid $5 to underwrite the cost of the evening’s dinner and awards presentation. The presentation of awards took a scant 15 minutes. The event was not broadcast. There was no anxiety about who would and wouldn’t walk away a winner that night because all the winners had been announced three months before the event. In a few hours the 87th Annual Academy Awards – officially called The Oscars only since 2013 – will get underway in L.A.’s Dolby Theater. This is the culmination of the awards season. The show will last a little more than 15 minutes. It will be broadcast live worldwide. Millions of dollars have been expended on Oscar campaigns for films and individuals but the nominees will sit on pins and needles until his or her name is or is not called. So just about everything has changed from the first Academy Awards. One thing remains the same: your life and my life will not be affected one iota by the show or the outcome of the awards. For that reason I don’t make Oscar picks and I’m not disappointed in the outcomes. I have no emotional or financial investment in the goings on tonight. I just enjoy the show — because I choose to. If I choose not to enjoy it then I stop watching. What I can never figure out is why people choose not to enjoy the show and choose to keep watching. Look, it’s an important event but it’s not that important. In the grand scheme it has some meaning but probably not as much as its champions think or as little as its detractors claim. It is an economic engine for AMPAS and a marketing tool for the players fortunate enough to be on the ballot. It is a pop culture touchstone. It’s fun to debate but it’s pointless to kvetch. The Oscars are a celebration of movies, making movies and the people who make movies. I watch because I love all of those things as well. Nominated for 8 Academy Awards, THE FRENCH CONNECTION took home 5 — including Picture, Director & Actor. 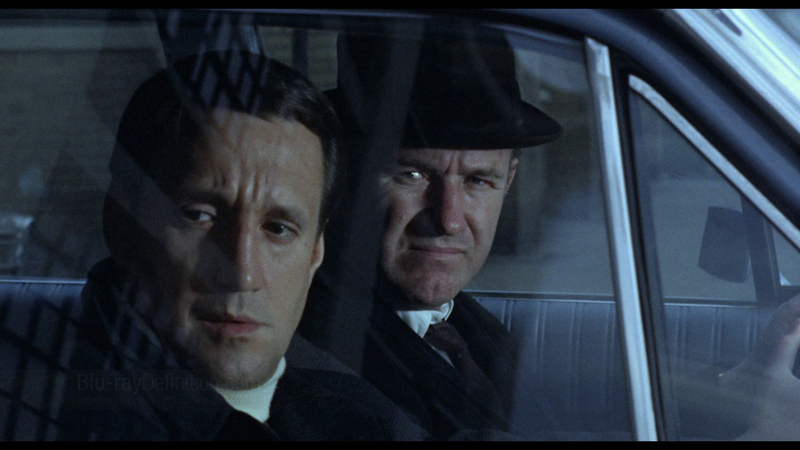 Howard Hawks’s biographer, Todd McCarthy, claims that Hawks was a driving force behind the 1971 film that made Hackman a star and put Friedken in the driver’s seat of his career. (His next stop was THE EXORCIST.) IMDb lists the legendary director (Hawks) as an uncredited writer on the film. Friedkin is pretty convincing as he debunks the rumor that Hawks had anything to do with THE FRENCH CONNECTION in this interview. *Every Monday I watch a classic movie that falls into one of these categories: 1) Have never seen it, or 2) Have never seen it uncut, or 3) Have only seen it once, or 4) Haven’t seen it in a very long time. I’ll be watching tonight. I’ve been watching the Oscars since I was a little kid and it’s something we look forward to and enjoy around here. I’ve held a few Oscars. (They’re as heavy as you’ve heard.) I’ve met a dozen or so Oscar winners and have enjoyed discussing their Oscar night experience. I probably wouldn’t pass up an opportunity to attend but unless I had a dog in the fight, watching from home in a quiet room is always my first choice. I snapped this pic on the Fox lot last year while attending a premiere in the Zanuck Theater. 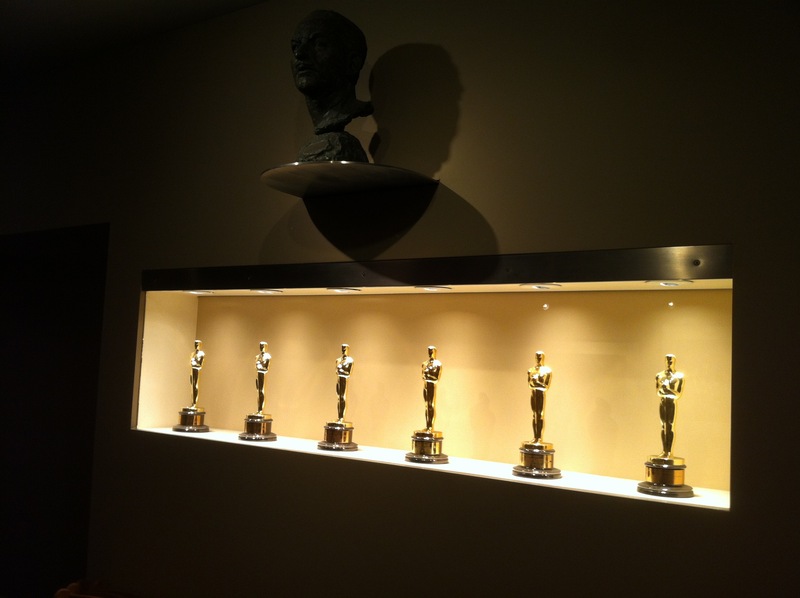 The bust above the Oscars is of legendary studio chief, Daryl Zanuck. I don’t make Oscar predictions. Trying to guess who or what will win, or getting worked up over someone being “robbed” just adds stress to the whole thing that I don’t need. I have enough disappointment as a Dallas Cowboys fan. I don’t care how long the show lasts or if it’s boring or entertaining. I have no opinion about the host. It’s the Industry’s prom and I’m glad just to peek in and see what’s going on. The Oscars are not indicative of who or what is the “best” in any given year of movies. The Oscars are a snapshot of the taste and temperament of the majority of Academy voters in any given year. Sometimes the Academy gets it right and sometimes they get it wrong but it’s never an objective evaluation of anything. The Academy of Motion Picture Arts and Sciences may or may not have been started primarily as way for the Moguls to deal with unruly labor disputes. In other words, as a way of keeping an eye on the bottom line. Back in 1926, MGM’s Louis B. Mayer, who was for several years the highest paid executive in the United States, proposed the idea of the Academy at a social gathering. No one objected. The Moguls put the organization together and asked for a non-profit charter from the State of California. Someone suggested that, like any professional association that promotes its wares, some kind of annual awards of merit should be presented. Everyone thought that was a capital idea. The Oscars have been and will always be a way of promoting the movie industry – which is fine by me. I love movies. I love making movies. I love people who make movies. Whatever happens tonight – sincere or insincere, tasteful or over the top, humble or outrageously arrogant – will be in the neighborhood of those three loves. And that’s why I watch. To celebrate Oscar week, Rev. Hollywood is giving an Academy Award-related sneak peek from an interview Tim Jackson did with Tom Schulman. Tom won the Best Original Screenplay Oscar for 1989 for his screenplay, DEAD POETS SOCIETY. This interview was conducted during the 2013 WRI Film Forum where both Tom and Tim were on the faculty. Enjoy the Oscars Sunday and check back here in the coming weeks for more original video content about movies, making movies and the people who make movies.